1 Cited by Kotzia (2007), 1102. 1In Chapter 3, we established that the verb “σηµαίνειν” was not used in the Homeric epics in the sense of “to mean”. We have yet, however, to comment on a feature of Homeric diction that emerges from the preceding discussions – that there is in fact no word for “meaning” or “to mean” (used of inanimate subjects in the sense of “to signify”) in the Iliad or Odyssey at all. While it is perhaps difficult for speakers of English to conceive of language without one, these early poems present no verb for talking about what (I) normal observed phenomena, (II) divine portents, (III) language, or (IV) dreams signify. The absence of this terminology does not, of course, entail that the concept of meaning did not exist – language does not necessarily reflect the intellectual furniture of its users, and, as we shall see, the Homeric narrator had other ways of negotiating scenarios in which the words “to mean” and “meaning” might have appeared – but the finding is nevertheless of clear interest for our investigation since it introduces the possibility of tentatively fixing a period for the initial set of metaphorical transferences considered in Chapter 4. In this chapter, we shall go through a representative selection of points a twhich an expression of meaning might have been employed, surveying examples where both linguistic and inanimate meaning more broadly conceived are in question. We shall then move on to discuss the Archaic period as a possible context for the transference of the vocabulary. The Greek material is particularly important for our investigation; it is worth investigating at some length. ἂψ ἐπὶ νῆας ἴµεν, µηδ᾽ Ἕκτορι ἶφι µάχεσθαι. “Ah, woe is me, why are the long-haired Achaeans once again being driven to the ships in rout over the plain? Let it not be that the gods have brought to pass woes grievous to my heart, as my mother declared to me, telling me that even while I lived the best of the Myrmidons would leave the light of the sun beneath the hands of the Trojans. Surely the powerful son of Menoetius is dead, headstrong as he was. Indeed, I commanded him that he was to return to the ships when he had pushed away the destructive fire, and not to contend in might with Hector” (Homer, Iliad 18.6-15). “So she, drawing closer, washed her lord; and immediately she noticed the scar which long ago a boar had driven into him with his white tusk” (Homer, Odyssey 19.392-393). πρὶν ἔγνων, πρὶν πάντα ἄνακτ᾽ ἐµὸν ἀµφαφάασθαι. “Surely you are Odysseus, dear child; but I did not recognize you until I had handled the whole body of my lord” (Homer, Odyssey 19.474-475). 6Here, one does not read “this means/signifies that you are Odysseus” – once again, the inference is introduced by the affirmative “ἦ µάλα”. These two moments are cited solely byway of example: vocabulary that is ubiquitous in the literature of later periods is not employed by the Homeric narrator in descriptions of sign interpretation in non-divinatory contexts. “Pay attention, when you hear the voice of the crane calling every year from the clouds above: she brings the sign for plowing and indicates the season of winter rain” (Hesiod, Works and Days 448-451 West). 6 On signs in Homer, see Nagy (1992), 202-222; Kahane (2005), 95-131. For Herodotus, see Appendix I.
ἀλλὰ Ζεὺς ἔτρεψε παραίσια σήµατα φαίνων. “Just as the son of crooked-counseling Cronus sends a star either as a sign for sailors or for abroad army of warriors...” (Homer, Iliad 4.75-76). ὅππως οἱκατὰ µ οῖραν ὑποκρίναιτο νοήσας. 11Thus, although these poems lack the subsequently attested terminology for inanimate meaning (even though words such as “σηµαίνειν” were already being used in other senses), the act of interpreting a sign is certainly represented in the Homeric vocabulary. Heroes could interpret and understand signs, although the Homeric narrator does not frame this in terms of their meaning. 13 Compare the interpretation of the portent by Halitherses at Homer, Odyssey 2.161-176.
τῷ δεκάτῳ δὲ πόλιν αἱρήσοµεν εὐρυάγυιαν. “Just as [the snake] has eaten the children of the sparrow and her herself (eight, however the mother who bore them was the ninth), we will fight here for as many years. But in the tenth we shall capture the city of broad streets” (Homer, Iliad 2.326-329). 13Later authors might have utilized an expression of meaning in order to describe what the portent meant,14 but Calchas simply uses the particles “ὡς” (“as”) and the accentuated form “ὥς” (“thus”) in order to build an analogy between the omen and the future destruction of Troy. The Homeric narrator effectively bypasses the need to apply one of the subsequently attested expressions of meaning, employing the structure of the Homeric simile in order to create an analogy between the observed phenomenon and what it means. ἄλλη δ᾽ ἄλλων γλῶσσα πολυσπερέων ἀνθρώπων. ἀλλὰ γλῶσσα µέµικτο, πολύκλητοι δ᾽ ἔσαν ἄνδρες. “For they had not all the same speech or one language, but their tongues were mingled, and they were men summoned from many lands” (Homer, Iliad 4.437-438). πολλὰ µάλ᾽, οὐδ᾽ ἂν νηῦς ἑκατόζυγος ἄχθος ἄροιτο. παντοῖοι, ἐπέων δὲ πολὺς νοµὸς ἔνθα καὶ ἔνθα. ὁπποῖόν κ᾽ εἴπῃσθα ἔπος, τοῖόν κ᾽ ἐπακούσαις. “There are insults for both of us to utter, many of them; nor would a ship with a hundred benches bear the load of them. Pliant is the tongue of mortals, and there are in it all sorts of different words, and the range of speech is wide on this side and on that. Whatever word you speak, such a word you will hear” (Homer, Iliad 20.246-250). 17Once again, we find mention (in highly metaphorical language) of the multifarious nature of language and its effects, but nowhere lexical reference to meaning or signification. “Ἀστυάνακτ᾽”· οἶος γὰρ ἐρύετο Ἴλιον Ἕκτωρ. “Hector called him [his son] ‘Scamandrius’, but the others [Trojans] called him ‘A styanax’; for Hector alone saved Ilium” (Homer, Iliad 6.402-403). 19The one referent (Hector’s son) has two different names, whereby the verb “καλεῖν” takes the namers as its grammatical subject; rather than equating the two terms by saying that “‘X’ means ‘Y’”, we find Hector and the other Trojans simply naming the referent differently; an explanation for the second name is introduced by means of the particle “γάρ”. 21 On Homeric names, see von Kamptz (1982). 21The listener is evidently intended to pick up such effects on his or her own; no aid is given, nor is the pun explained, and we certainly do not find phrases such as “‘X’ means ‘Y’” to make it explicit. One might compare the examples of wordplay in Hesiod where no expression of meaning is employed – for example, in the linking of Aphrodite’s name to the manner of her birth (Hesiod, Theogony 195-198 West), or that of the term “Titans” to the participle of “to strive” (“Τιτῆνας”, “τιταίνοντας” Theogony 207-209 West). “For how do you enjoin or command me with your speech? Shall I wait with them there, waiting until you should come, or should Irun back to you again, whenever I have fully instructed them?” (Homer, Iliad 10.61-64). “But, Achilles, see to it yourself that reverence accompany the daughters of Zeus” (Homer, Iliad 9.513-514). 27 Cf. Theognis, Elegies 681-682, just after the image of the Ship of State caught in a storm. 25The meaning of the tale is left unexplained. Similarly, in the Works and Days Hesiod concludes the αἶνος of the Hawk and the Nightingale with an injunction rather than an explanation:26 the audience is expected to interpret the meaning of the allegory for itself.27 Evidently, interpretation is an issue, but the singer does not employ the vocabulary that we investigated in the earlier chapters in order to bring it to the fore. 28 For a treatment of these instances, see Macleod (1983), 1-15; Halliwell (2012), Chapter 2. “Lord Alcinous, most conspicuous of all men, truly this is a good thing – to listen to a singer such as this man is, similar to the gods in voice” (Homer, Odyssey 9.2-3). ἥ τις ἀϊόντεσσι νεωτάτη ἀ µ φιπέληται. “For this man, there is no retribution if he sings the evil doom of the Danaans; for men praise that song the most which is the newest to hover around their ears” (Homer, Odyssey 1.350-352). 19. ἀλλ᾽ ἄγε µοι τὸν ὄνειρον ὑπόκριναι καὶ ἄκουσον. “But come – hear and interpret my dream” (Homer, Odyssey 19.535). 30Odysseus himself uses the same verb in his response, where he states that there is only a single way of interpreting the dream: “οὔ πως ἔστιν ὑποκρίνασθαι ὄνειρον ἄλλῃ ἀποκλίναντ᾽” (“there is no way to interpret the dream by bending in any other direction” Homer, Odyssey 19.555-556).32 Here things are phrased as a matter of interpretation (in the use of the verb “ὑποκρίνεσθαι” we can see a basic similarity to Menelaus’ interpretation of the divinely sent sign at Odyssey 15.170), but not in terms of what the dream means. The vocabulary of meaning appears to be missing in this case as well. 20. καί µιν φωνήσας ἔπεα πτερόεντα προσηύδα. “And addressing him [the dream], he spoke winged words” (Homer, Iliad 2.7). 21....στῆ δ᾽ἄρ᾽ ὑπὲρ κεφαλῆς καί µε πρὸς µῦθον ἔειπεν. “...he [the dream] stood above my head and addressed me” (Homer, Iliad 2.59). 34We have seen a number of ways in which the Homeric narrator engages with the concept of significance and meaning without recourse to the vocabulary that we see in the texts of the Classical period. First, (a) the speaker can circumvent the need to use an expression of meaning by launching straight into the interpretation, possibly employing emphatic particles such as “ἦ µάλα” (“truly”); (b) verbs of interpretation such as “ὑποκρίνεσθαι” (“to interpret”) can be employed in inquiries as to the meanings of things like dreams and words; (c) when two names exist for one referent, we can find individual parties naming (“καλεῖν”) an object differently, which establishes a correspondence between the names;(d) it is also possible to inquire as to the meaning of a command by employing phraseology that puts the command itself (for example, “µῦθος”) into the dative; (e) characters can frame what a sign means by using the terms of a simile (“ὡς”/“ὥς”); finally,(f) we see things like dreams being transformed into animate subjects in their own right (for instance, Agamemnon’s dream at the beginning of Iliad 2). The Homeric narrator deals with issues of interpretation and signification in ways that are different from what we find in the writing of the fifth and fourth centuries BC: nowhere do we find an expression of meaning (in the sense of “to signify”) employed in the Homeric or Hesiodic poems, save perhaps for the fairly trivial example of the verb “εἶναι” in the sense of “X is [the same as] Y”. 35There are, of course, various factors that we should bear in mind in weighing this evidence. First, we should not conclude that expressions of meaning necessarily did not exist during the prehistoric period just because the relevant terminology does not occur in the Homeric corpus: it may simply be a fluke of the tradition that we do not find any examples preserved. Second, the Homeric dialect does not represent the language of real life – it is an artificial language formed under exigencies that would never have manifested themselves in everyday speech. Third, although there were opportunities for the application of an expression of meaning in these early poems, their subject matter differs greatly from that of the works of Herodotus and Plato: indeed, Apollonius’ Argonautica, which covers similar subject matter to the Iliad and Odyssey yet was written centuries later (and well after Plato), also shows scant usage of expressions of meaning, although this may simply reflect the fact that Apollonius is successfully imitating Homeric diction. It should also be noted that the third-century poet certainly did use the verb “σηµαίνειν” of inanimate grammatical subjects, an application that is unattested in Homer (see Apollonius Rhodius, Argonautica 4.1378-1379). 37 The example is found in Riemer (2010), 10. 38In addition, the explosion of philosophical thought, for which the new medium served as a catalyst, made use of language in striking new ways: Heraclitus’“λόγος” and Anaxagoras’ “νοῦς” present just two examples of an old word being re-deployed in order to articulate a new philosophical concept during this period.41 Might not the same be true for the vocabulary of meaning? 42 On this, see in particular Pfeiffer (1968); Ford (2002); Obbink (2010). 46 On the changes of this period, see Yunis (2003). 40The great majority of the Greek excerpts in the previous chapters issue from the period between 450 B C and 300 BC – the age of Herodotus, Euripides, Aristophanes, Plato, and Aristotle.47 These authors were the beneficiaries of a prior history of experimentation with expressions of meaning and had at their disposal an expansive vocabulary to talk about language itself. Sophists of the fifth century such as Gorgias, Prodicus, and Protagoras would have been important in the naturalization of this vocabulary,48 and the greater bulk of it was certainly established by the time when Plato was writing; in the passage from the Euthydemus that we considered in the Introduction, it is clear that the verb “νοεῖν” was being used in everyday conversation to denote what an expression means – it is precisely the appropriateness of the verb in this usage that makes the objection of Dionysodorus ludicrous. Plato represents for us the tail end of a largely undocumented experiment with language that begins with our earliest literary remains; it is only with the copia of the philosopher’s dialogues, however, that we are able to note the profound linguistic and conceptual changes that had occurred since the composition of the Homeric epics. Unlike Homer and Hesiod, Plato is able to apply expressions of meaning to inquire what words themselves mean;49 words for Plato “make signs” without any direction from Zeus. 42In the first half of the fifth century, Aeschylus and Pindar made use the “tablets of the mind” metaphor, which explicitly set the workings of human memory in terms of the new technology (see, for example, Aeschylus, Suppliants 176-179).52 It is only in the early fifth century that the principal Greek verb of reading (“ἀναγιγνώσκειν”) is first attested in the relevant sense (see Chapter 7). Indeed, the Greek words “ποιητής” (“craftsman”) and “ποίηµα” (literally, “made thing”), which we take for granted as set fixtures of ancient Greek, were actually creations of the fifth century and represent are flex to changing attitudes towards song culture and criticism.53 Experimentation with the new medium was occurring at a rapid pace, and the changes may very well have also been reflected in the development of the Greek vocabulary of meaning.54 By the time of Plato, the process was essentially complete: the terminology of meaning was, save for a few exceptions, set from the early fourth century onwards and in a position to influence the subsequent European languages (be it directly or indirectly). 43The foregoing must, however, remain a theory: there is no way to prove the case either way. My overall argument does not concern the precise dating of the metaphorical transference as much as it does the fact that one took place; given the evidence that we have been considering in this book, it seems as if it did. This transference has undergirded a substantial percentage of our own vocabulary of meaning, since the modern languages derive largely from the ancient ones. We are dealing with a tradition that spans languages as well as centuries: Greek expressions of meaning influenced the Latin ones, which in turn evolved into the Romance items, which came ultimately to influence the English vocabulary of meaning. The Anglo-Saxon verb considered at the beginning of Chapter 2, which ultimately yielded the English “to mean”, seems only to strengthen this understanding of the origins of the classical expressions of meaning – here we have an unrelated expression at the beginning of its historical record that displays the same polysemy as the classical examples; although the etymology of the verb is unclear, the case for metaphorical transference would seem to be compelling here as well. 44In this chapter I have laid out an argument for a development that occurred at an extremely important yet obscure juncture inhuman history – the Archaic and early Classical ages in the Greek-speaking world. The Homeric poems, the product of perhaps a millennium of oral poetry, entirely lack the subsequently attested vocabulary of meaning, while the authors of fourth-century Athens had at their disposal a range of different expressions. Obviously, much must remain speculative; I would only emphasize that it is by no means obligatory for a language to contain expressions of meaning beyond the standard copula of the verb “to be”. I would moreover suggest that the development of such terminology in Greek depended on certain cultural and technological innovations, which facilitated a different type of interaction with language than had been possible before; the first inkling of this can be noted in the early allegorical tradition, but it was developed over the course of the late sixth and early fifth centuries, and may well have had a pre-history. At the end of it all, we find Socrates and Dionysodorus disputing the appropriateness of the verb “νοεῖν” when applied to inanimate subjects. 2 Compare Edwards’ paraphrase of this episode in his commentary: “Akhilleus realizes that the rout of the Greeks (6-7) and the remembered prophecy (7-11) must mean Patroklos is dead, despite his own attempt to prevent this”; Edwards (1991), 143 (my emphasis). 3 West (1978), 272, on “ἥ τ᾽”: “the γέρανος, I take it, not the φωνή”. Aratus (third century BC), writing in a Hesiodic vein, simply describes the movement of geese as a sign for a storm: “καὶ χῆνες κλαγγηδὸν ἐπειγόµεναι βρωµοῖο χειµῶνος µέγα σῆµα...” (“geese as well, hurrying noisily to their source of food, are a great sign of a storm...” Aratus, Phaenomena 1021-1022). 4 An Aeolic form of the verb “δεικνύναι” is used of the sun at Hesiod, Works and Days 526 West: “οὐ γάρ οἱ ἠέλιος δείκνυ νοµὸν ὁρµηθῆναι” (“for the sun does not show [the boneless one] a range towards which it can set out”); the sun is frequently personified in Hesiod (see, for example, Theogony 371-375 West). Something similar might be noted in the case of “ὄσσα” (“rumor”), personified as a divine messenger at e. g. Homer, Iliad 2.93-94 and described as “carrying” renown at Odyssey 2.216-217. 5 Instead of talking about what a phenomenon “means”, Hesiod frequently uses a “when... do this” or “this will happen” construction, for example: “Πληιάδων Ἀτλαγενέων ἐπιτελλοµενάων ἄρχεσθ᾽ ἀµήτου...” (“when the Atlas-born Pleiades rise, start the harvest...” Hesiod, Works and Days 383-384 West); cf. Works and Days 458-459, 564-567, 571-572, and 609-611 West. 7 Cf. Homer, Iliad 2.353. For an example from the Odyssey: “ἔφηνε θεὸς τέρας” (“the god showed the sign” Homer, Odyssey 15.168). See also the longer excerpt at Odyssey 20.95-121, where we find the phrases “Διὸς τέρας ἄλλο φανήτω” (“let another sign from Zeus be shown” 101), “σῆµα ἄνακτι” (“a sign for the lord” 111), and “τέρας... φαίνεις” (“you are showing a sign...” 114). 8 Cf. Odysseus’ reaction to Zeus’ signal at Homer, Odyssey 20.104: “γήθησε δὲ δῖος Ὀδυσσεύς” (“and noble Odysseus rejoiced”). 9 Cf. Heubeck & Hoekstra (1989), 242, on “ὑποκρίνεσθαι”: “in Homer its meaning oscillates between ‘interpreting’ and ‘answering’”. 10 The polysemy of “ὑποκρίνεσθαι”, it should be noted, also allows this excerpt to be translated as “how he might with understanding reply”. 11 Even non-seers could perform this function; see, for example, Helen’s interpretation of the sign at Homer, Odyssey 15.172-178. On seers more generally, see Flower (2008). 12 “ἀλλ᾽ ἄγε δή τινα µάντιν ἐρείοµεν ἢ ἱερῆα... ὅς κ᾽ εἴποι ὅ τι τόσσον ἐχώσατο Φοῖβος Ἀπόλλων” (“but come, let us ask some seer or priest... who may say why Phoebus Apollo has grown so angry” Homer, Iliad 1.62-64). 14 Compare the phrasing found in the commentary of Kirk (1985), 150: “one might expect the meaning to be that eight years had passed and Troy would fall in the ninth” (my emphasis). 15 See Gera (2003), 1-4. On discourse in the Homeric poems in general, see, for example, Martin (1989); Pelliccia (1995); Mackie (1996); Gera (2003); Beck (2005). 16 Hesiod, in describing the sounds emitted by the monster Typhon, mentions that sometimes the gods could “hear” him: “φωναὶ δ᾽ ἐν πάσῃσιν ἔσαν δεινῇς κεφαλῇσι, παντοίην ὄπ᾽ ἱεῖσαι ἀθέσφατον · ἄλλοτε µὲν γὰρ φθέγγονθ᾽ ὥς τε θεοῖσι συνιέµεν...” (“there were voices in all his dreadful heads, sending forth every kind of sound unutterable: sometimes they made sounds such as the gods heard...” Theogony 829-831 West). Cf. LSJ s.v. “συνίηµι” II. This passage opens the discussion of ancient criticism in Too (1998); cf. Goslin (2010), who sets the defeat of Typhon, occurring shortly before the birth of the muses, within the civilizing process of the triumph of Zeus. 17 Kirk (1985), 245-246, notes how unnecessary such an injunction would have been at this stage in the war. Cf. Homer, Odyssey 19.545: “φωνῇ... βροτέῃ” (“human speech”). 18 One might also adduce the instances of the phrase “ἀλλοθρόους ἀνθρώπους” in the Odyssey (“men who speak a different language” Odyssey 1.183, 3.302, 15.453). 19 Compare the simile likening Sleep to a bird in Homer, Iliad 14: “ὄρνιθι λιγυρῇ ἐναλίγκιος, ἥν τ᾽ ἐν ὄρεσσι ‘χαλκίδα’ κικλήσκουσι θεοί, ἄνδρες δὲ ‘κύµινδιν’” (“like to a shrill bird in the mountains, the one which the gods call ‘chalcis’, while men call it ‘kumindis’” Homer, Iliad 14.290-291). For moments where the different vocabulary of gods and men comes to the fore, see Homer, Iliad 2.813-814; 20.74; 1.403. Cf. Ennius, Annales fr. 487 Skutsch. The Australian language Warlpiri, which lacks a dedicated verb of S-meaning, can phrase things in the same way; for examples, see Riemer (2010), 10. 20 See Pfeiffer (1968), 3-5. Fried (2005) interestingly links “Ὀδυσσεύς” with “ὀδοὺς συός” (“tooth/tusk of a boar”). 22 Cf. Heubeck, West, & Hainsworth (1988), 83; Stanford (1952); von Kamptz (1982), 355-360. See also the naming of Odysseus at Homer, Odyssey 19.406-412. 23 See Richardson (1993), 54; cf. Plato, Cratylus 404b. Plutarch (Isis and Osiris 363d) and later allegorists such as Cornutus (Compendium 3) made much of the etymology. 24 Words are of course described metaphorically in Homer: “ἔπεα πτερόεντα προσηύδα” (“he spoke winged words” Homer, Iliad 1.201). On this expression, see e.g. the first chapter of Martin (1989). Cf. “ποῖόν σε ἔπος φύγεν ἕρκος ὀδόντων” (“what word has escaped the barrier of your teeth?” Homer, Odyssey 1.64). 25 On this much-debated passage, see for instance Yamagata (2005). For the passage’s status as an allegory, see Hainsworth (1993), 128-129. 26 Cf. “ὦ Πέρση, σὺ δ᾽ ἄκουε Δίκης, µηδ᾽ ὕβριν ὄφελλε” (“but you, Perses, listen to right and do not foster outrage” Hesiod, Works and Days 213 West). For bibliography on this passage, see Zanker (2009). 29 Cf. Halliwell (2012), 45: “The most basic level of poetic experience in Homer is, unsurprisingly, a matter of ‘pleasure’ or ‘gratification’, signified above all by the verb τέρπειν-εσθαι (give/take pleasure) and its cognates”. 30 Cf. Alcinous on Odysseus’ speech: “µῦθον δ᾽ ὡς ὅτ᾽ ἀοιδὸς ἐπισταµένως κατέλεξας” (“you have spoken your story skillfully, like a poet” Homer, Odyssey 11.368). 31 As we saw in the previous chapter, expressions of meaning also fail to materialize in the few cases where writing possibly figures in the Iliad. We have along way to go before the “criticism” of Plato’s Protagoras. On this development, see Ford (2002). 32 For an interesting reading of this passage, see Levaniouk (2011), 229-246. Rutherford, following the orthodox interpretation, applies the participle “ἀποκλίναντ’” to the interpreter in the sense of “bending” or “twisting”; he provides the gloss “twisting it [the dream] to mean anything else”; Rutherford (1992), 195-196. 33 One might also note Achilles’ dream of Patroclus in Iliad 23. Compare the longer passage at Homer, Odyssey 4.795-841, where Athena sends a dream in the shape of a woman to Penelope; also compare Penelope’s description of the dreams moving through the gates of horn and ivory in Odyssey 19.560-569, where she refers to them as “ἀκριτόµυθοι” (“babbling”). 34 Aristotle already comments on personifying metaphor in Homer at the lexical level (Rhetoric 1411b24-1412a9). 35 For a speaking dream in Pindar, see Pythians 4.163. Aratus, writing in the third century BC, incidentally uses this method of conferring agency on what are essentially inanimate signs: “ἐσκέψατο δ᾽ εἰς ἐνιαυτὸν ἀστέρας οἵ κε µάλιστα τετυγµένα σηµαίνοιεν ἀνδράσιν ὡράων” (“[Zeus] organized stars on a yearly basis, so that they might signal the most clearly defined signs of the seasons to men” Aratus, Phaenomena 11-13); cf. “ἀστέρες ἀνθρώποισι τετυγµένα σηµαίνουσιν” (“the stars that signal clearly defined signs to men” Aratus, Phaenomena 757); “ἄλλα δέ τοι ἐρέει ἤ που διχόωσα σελήνη...” (“some things the moon will tell you, either halved...” Aratus, Phaenomena 773); “ὁπποίην καὶ σῆµα λέγοι” (“[such a day appears] as the sign foretells” Aratus, Phaenomena 1148). On signs in Aratus, see Volk (2012). The technique was broadly used in this period; compare Theocritus, Idylls 22.22. 36 Besides a possible participle whose root resembles that of “δεικνύναι”, I have been unable to find the vocabulary in the MGL; extant Mycenaean Greek has few verbs. 38 I have been unable to locate any verb of meaning applied to an inanimate grammatical subject in early Greek lyric, iambus, and elegy; nor is the vocabulary represented (in the relevant sense) in the fragments of the Presocratic philosophers. The first appearances of S-meaning usages are from the fifth century (see Chapters 2and 3). 39 For strong interpretations of the changes that literacy brought with it, see in particular Snell (1953), Havelock (1963), Havelock (1986), Goody & Watt (1968), and Ong (1982). McLuhan (1962/2011), 27, puts the view forward vividly: “But the means of arrested visual analysis, namely the phonetic alphabet, was as new to the Greeks as the movie camera in our own century”. The “Toronto School” of communication studies was motivated in large part by Albert Lord (2000, originally 1960) and the fieldwork of Milman Parry. For a deflationary take, however, see Thomas (1992), 44-51; Foley (1999), 1-15; Bakker (1999); for a reappraisal (and coining of the term “neo-Havelockian approach”), see Ford (2003). 41 See the indices in Diels and Kranz, s.v. “λόγος”, “νοῦς”. For a quick overview of the question of literacy and early Greek philosophy, see Kahn (2003). Heraclitus himself was certainly interested in issues of language, commenting, for example, on the striking similarity of “βίος” (“life”) and “βιός” (“bow”) in Greek: “τῷ οὖν τόξῳ ὄνο µ αβίος, ἔργον δὴ θάνατος” (“the name of the bow is ‘life’ but its work is death” Heraclitus 22B48 DK); for some interesting thoughts on this fragment from the perspective of literacy, see Gianvittorio (2013), 15. For the translation of “λόγος” as “Sinn”, see Diels and Kranz’ translation of 22 B 50 DK and Snell (1966), 139 (“er ist der Sinn, der in der Welt liegt, der der Welt erst ihren Gehalt gibt”), although this is controversial. For a strong interpretation of Heraclitus, see Kennedy (1989), 81: “It was perhaps Heraclitus who first recognized that a word, or a text, could have more than one valid meaning, which he seems to have thought of as resulting not from conventional association, but from the nature of words as motivated signs”. For Parmenides on language, see 28 B8.38-41 DK and 28 B19.3 DK: “τοῖς δ᾽ ὄνοµ’ ἄνθρωποι κατέθεντ᾽ ἐπίσηµον ἑκάστῳ” (“and for these things, human beings have applied a name that marks each one”). 43 See Yunis (2003), 194: “Both Xenophanes and Heraclitus assume that Homer’s text is a transparent, non problematic entity; its meaning is obvious and non contravertible. Nothing suggests that Xenophanes and Heraclitus were incapable of distinguishing between what Homer means and what he says. But since Homer’s meaning was apparently not at issue for those to whom Xenophanes and Heraclitus directed their criticism, to raise the question of what Homer meant would have added unwanted complications and distracted from their task”. 44 Pfeiffer (1968), 9-10. Ford (2002), 71: “Unlike Theagenes, most rhapsodes did not write up this lore since it was their stock in trade. Theagenes’ fame may spring from the fact that either he was the first to do so or he did it so well that no earlier work on Homer reached later antiquity”. 45 In the fifth century, Metrodorus of Lampsacus appears to have continued this allegorical trend (if we are to rely on later references); see Pfeiffer (1968), 35. 47 The first examples of medical literature (the earliest texts from the Hippocratic Corpus), which deal heavily with symptoms and signs, also belong to this era. 48 Cf. Sluiter (1990), 4-13; Sluiter (1997). On the creation of philosophical terminology in Greek, see Kotzia (2007). 49 Cf. Yunis (2003), 206: “[Socrates] scrutinizes any utterance, discourse, or text that he encounters, without regard for the manner in which he encounters it, the person from whom it emanates, or the form that it has, and he asks ‘what does it mean?’”. 50 One might perhaps also mention Callias’ comedy, The Letter Show, discussed fleetingly by Athenaeus and possibly dating to the late fifth century, which featured a chorus dressed as actual letters; cf. Svenbro (1993), 183-186; Rosen (1999). 51 Cf. Halleran (1995), 222: “the tablet and its contents are personified several times in this scene – 877 (“cries out, cries out”), 879-80 (“giving voice”), and at 881 (“leader”) – and the lei here and at 865 probably forms part of this personification”; cf. Aeschylus, Seven Against Thebes 646-647, on the representation of Dike on the shield of Polyneices: “Δίκη δ᾽ ἄρ’ εἶναί φησιν, ὡς τὰ γράµµατα λέγει” (“she claims to be Dike, as the writing proclaims”). 52 For other instances, see Pfeiffer (1968), 17 and 26. Today, of course, the computing metaphor for mental processes exerts a strong influence. 53 See Ford (2002), 131-157. The older term was “ἀοιδός” (“singer”). Sophisticated metalanguage (language for talking about language) is not something one would expect to find in a nearly culture; the terms “ὄνοµα” and “ῥῆµα” only came to be used in the definite senses of “noun” and “verb” in the fourth century (Plato, Sophist 262a). See Gianvittorio (2013), 5. 54 Compare Svenbro (1993), 5: “Not until silent reading was conceptualized – possibly as early as the late sixth century BC – could writing be regarded as representing a voice. Now the letters could themselves ‘speak’ directly to the eye, needing no voice to mediate... In short, the internalization of the voice in silent reading corresponds to the metaphor of ‘letters that speak’, which became current at the point where silent reading began to be more or less commonly practiced. For anyone reading in silence, as Theseus does in Euripides’ Hippolytus, the letters ‘speak’, they ‘cry out’, or even ‘sing’. The eye is the sound”. ZANKER, Andreas T. Chapter 5: Evidence from Early Greek Poetry In : Greek and Latin Expressions of Meaning : The Classical Origins of a Modern Metaphor [en ligne]. München : C.H.Beck, 2016 (généré le 21 avril 2019). Disponible sur Internet : <http://books.openedition.org/chbeck/1619>. ISBN : 9782821897106. DOI : 10.4000/books.chbeck.1619. Zanker, Andreas T. “Chapter 5: Evidence from Early Greek Poetry”. Greek and Latin Expressions of Meaning : The Classical Origins of a Modern Metaphor. By Zanker. München : C.H.Beck, 2016. (pp. 104-122) Web. <http://books.openedition.org/chbeck/1619>. 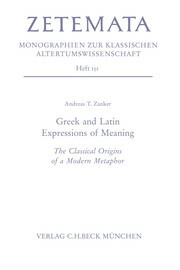 ZANKER, Andreas T. Greek and Latin Expressions of Meaning : The Classical Origins of a Modern Metaphor. Nouvelle édition [en ligne]. München : C.H.Beck, 2016 (généré le 21 avril 2019). Disponible sur Internet : <http://books.openedition.org/chbeck/1609>. ISBN : 9782821897106. DOI : 10.4000/books.chbeck.1609. Zanker, Andreas T. Greek and Latin Expressions of Meaning : The Classical Origins of a Modern Metaphor. München : C.H.Beck, 2016. Web. <http://books.openedition.org/chbeck/1609>.